I've been taking Palm fruit for couple of years or so and I'm very happy with it. My hair looks thicker and has regrown the front part of my scalp which had thinned out. Very reliable. Keeps me upto date when the next order has been shipped and answers questions I may have promptly. I have been taking this supplement for about 3 1/2 years now. From my experience, this isn’t something that you can take for 30 days and expect to see any lasting results; hence the negative reviews. Prior to taking this, I went to my doctor for a physical with a complete blood test. I am a 35 year old male who is extremely active, with a high stress job, who has had naturally high cholesterol since childhood (both HDL and LDL are high). Melanoma also runs in my family. Since taking this supplement, without any other significant changes in activity/diet, my blood test results have extraordinarily improved. My HDL cholesterol stayed high (the good kind), and my LDL cholesterol dropped. My blood pressure is phenomenal and despite being in a very high stress career (law enforcement), people always make comments on how I look 10 years younger than I am. The way my skin responds to sun exposure is also noticeably different. I didn’t notice this until the 6 month mark. In my profession, during California summers, on days I forgot sunscreen, I almost always received a slightly sunburned face/forearms. That doesn’t happen anymore. All of these changes have been relatively subtle over a prolonged period of time. The long term benefits with this product have been outstanding. I highly recommend it. Lastly, I have had some questions for this company during my years of using their product. All of my questions have received a response within hours of emailing them. Their response to questions/concerns is unmatched. I have been taking this supplement for about 3 1/2 years now. From my experience, this isn't something that you can take for 30 days and expect to see any lasting results; hence the negative reviews. Prior to taking this, I went to my doctor for a physical with a complete blood test. I am a 35 year old male who is extremely active, with a high stress job, who has had naturally high cholesterol since childhood (both HDL and LDL are high). Melanoma also runs in my family. Since taking this supplement, without any other significant changes in activity/diet, my blood test results have extraordinarily improved. My HDL cholesterol stayed high (the good kind), and my LDL cholesterol dropped. My blood pressure is phenomenal and despite being in a very high stress career (law enforcement), people always make comments on how I look 10 years younger than I am. The way my skin responds to sun exposure is also noticeably different. I didn't notice this until the 6 month mark. In my profession, during California summers, on days I forgot sunscreen, I almost always received a slightly sunburned face/forearms. That doesn't happen anymore. All of these changes have been relatively subtle over a prolonged period of time. The long term benefits with this product have been outstanding. I highly recommend it. Lastly, I have had some questions for this company during my years of using their product. All of my questions have received a response within hours of emailing them. Their response to questions/concerns is unmatched. This product has helped my skin complexion in a drastic way. It also has great heart health properties. Easy to deal with. Product is on reorder each month so I get with no issues and very quick shipping. I bought this product because I read that it would be helpful for my hair loss. I have PCOS, so I’m constantly searching for natural remedies. While I’m not sure if it has helped (it certainly hasn’t hurt), I did notice that this supplement acts as an internal sunblock for some reason. I don’t burn anymore, and my skin does look healthier! 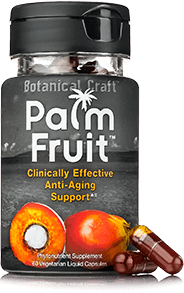 I chose Palm Fruit because I was familiar with the company's founder, Eric Potratz, from when he used to work with another supplement company and I know him to be both knowledgeable but also very ethical, which is rare in the supplement industry. It was also important to me that the fruit comes from plantations that protect orangutans and which don't use slash and burn cultivation like most palm fruit plantations do. I use Palm Fruit to get the FULL SPECTRUM of vitamins A&E which have a slew of benefits. I've been using the product for a year and am in good health, and I take it to remain in good health rather than to treat any specific issue. However, I've noticed (and my barber has commented) that my hair seems thicker than before, which I attribute to the Palm Fruit as there are studies supporting its use for hair loss. Just be sure to take it with fat or it won't be absorbed! Never any problems with shipping or managing my subscription. The product is always well packaged and arrives on time and in good condition. I love my Red Palm! My skin hair feels amazing! I have more energy too! Don't really get hangovers anymore after using this. Nice tone to my skin, and I feel (no bloodwork) like my prolactin has decreased. Easy to change shipping address, orders delivered promptly. This palm fruit has really helped my skin. I never burn in the sun at all. Love it. I have taken Palm Fruit since it was brought onto the market.I chose it because it is the ultimate source of tocotrienos available with definite effects and anti aging effects.The skin is also so soft and resistant to Sun damage since taking it.Excellent customer service plus a super price for regular shipments are also a massive bonus for this cutting edge vitamin E supplement! This vitamin E supplement is the world leader in tocotrienols and phytonutrients. I have taken it since its launch & feel the benefits that are claimed are totally noticeable & lasting at a price that is especially attractive to the regular customer! I've been using this as a staple since 2015. I'm currently a 35 y/o male. Hair: For hair it definitely helped with quality/health aspect in terms of being thicker. At one point the barber used thinning scissors after a few months on. I have a small amount of hairline recession near temples, but the rest is solid. I originally noticed some hair loss years ago, and this has seemed to slow it to a crawl..... If I compare to any other male in my family my hairloss is far far less and I do believe this product is a major ingredient against hairloss. Skin: It seems like a lot less acne after a few months in. I used to have more breakouts. This has really really cut them down. I feel that this product is reversing the aging process in my life. My skin looks better as a result of this product. Botanical Craft is a company that appears to be very serious about researching and creating the best products possible to support good health. I appreciate their passion for health! I have been using this product for a year and love it. I have noticed a marked improvement in the appearance of my skin with a reduction of fine lines and better elasticity. Taking this product has also increased my tolerance of being in the sun. After a year, distinct changes in skin appearance, improvement of vision, better stamina and exercise recovery, beard and hair texture have improved. Prompt, courteous, easy to change delivery amount and frequency. Customer loyalty is rewarded. After a year of one daily, I'm using my eyeglasses less. Noticed decrease in hairless, more fullness in hair, and overall better complexion. Love this supplement, and add it to my nutrition ritual. Have not found a product that rivals this, this Palm Fruit broad spectrum E is King. Good results, Better than T8. Always prompt, and immediately sort out issues. Adjusting delivery times at the site is a great plus as well as customer loyalty. Thanks guys! Miracle in an orange capsule!! Botanicalcraft is a top notch company!! They get right back to you if you ever have any questions and their shipping is lightning fast and always on time..Would highly recommend this product if you are just trying to slow father time down just a little..Love this product!! Of course, just letting you know that, I can correlate, directly, some profound changes in energy levels, longer sleep/wake periods with my 2 daily. First thing is a more youthful appearance I have noticed. Another big item is the thinning hair in the front of my head is now growing back to the point people are starting to notice. I never really cared about it to be honest but a nice benefit for sure. I would recommend this to anyone. Well worth the money and ease of getting shipped every month. Could not be happier. I remember Eric's bodybuilding products back in the day and as usual his stuff is backed by science and real results.